I am a decoration fanatic. 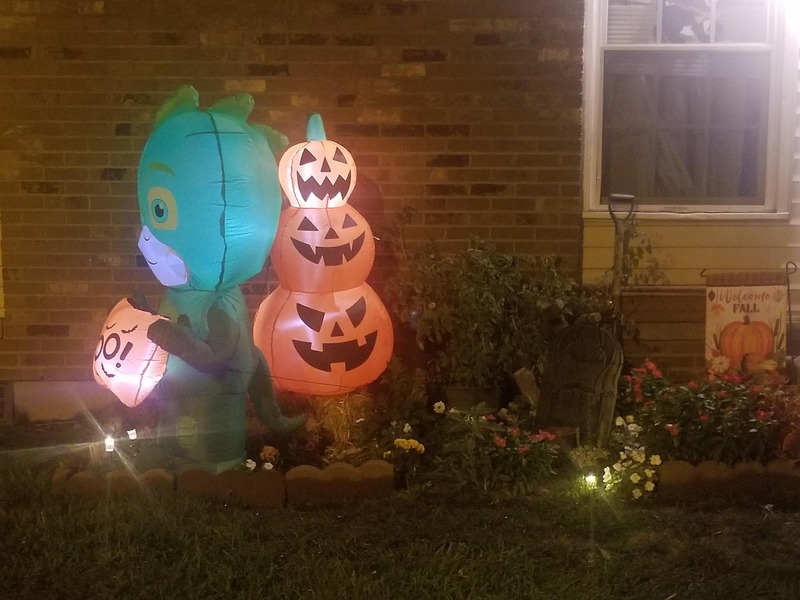 I only have a tiny bit of yard to use, but I make sure it’s decked out year round. It took me about 1-2 hours to clean it all up, but we still have a few patches of yellow paint my shampooer didn’t get on the carpet. I also got a nice, big hug while she was covered in it so I ended up with paint all over my pants. One DIY my kids have LOVED over the years are hanging ghosts. I made a small family years ago and my seven year old grew so attached to hers (she named him “Boo,” that she slept with him for over a year. These ghosts are super simple and super cute. You can get kits here with all supplies and instructions and there’s even bulk options for groups. Don’t forget to stock up on your favorite fall scents over the course of the entire holiday season. There are classic fall scents, you can even find leaf scented candles and there are tons of other fun, fall and Halloween related scents, like these Pumpkin Spice melts pictured. This is the wreath my kids and I made. I’m still thinking about adding to it, but I’m not 100% if I will or what to add. Take small chap sticks or lip glosses, wrap them with white tissue paper or fabric and tie them off. Draw on eyes and a mouth and you have party favor ghosts for Halloween parties. Take pencils, wrap small peices of burlap around the eraser, tied off and pull out like broom bristles and you have little witch’s brooms. Those ideas also came from Country Living, same edition as the pumpkins. Some other party favors for kid’s parties- sucker ghosts. Take suckers, wrap white tissue paper around and tie off with a rubber band and there are so many other ideas on sites like Pinterest. I’ll be posting more of the crafts my girls and I are working on over the month and I’ll be posting recipes for Halloween treats and desserts- always gluten and dairy free. I’ll be doing the same for Christmas.